Kitchen lighting is difficult to get right,Led Downlights are perfect, you need enough practical light to use your kitchen as intended, but you don’t want something too utilitarian or drab. A good kitchen lighting setting reflects an owner’s tastes, if you pardon the pun, and can transform an ordinary kitchen into something more striking and homely. What’s more, Led lighting choices can be clever and intuitive, catering to the kitchen’s many uses and allowing for different aesthetics whether you are cooking, working or relaxing. Yet given the amount of time and energy spent in the kitchen as the social hub of a house, it is also good to choose energy efficient lighting to save you money on your bills and leave less of an environmental impact. LED lights are perfect for the kitchen; they are versatile energy saving lights which come in a host of styles and formats, and they are now available in a multitude of colours and shades. Whether you’re looking for warming pendant lights for high, industrial-style kitchen ceilings or cool LED strip lights for brightening up crisp and modern worktops, here we’ll shed some light on how to choose the perfect LED setup. LED bulbs are long-lasting, environmentally friendly and energy efficient. If you haven’t already made the switch, now is the perfect time to start. With that said, when designing your kitchen’s lighting setup, it’s good to know the basic uses of each lighting type and how to choose the perfect LED for each one. LED downlights can be positioned to hide areas you’d prefer to be in dark, or brighten up large sections of the house to compensate for poor natural lighting. Get creative about where you decide to place your light sources. Incorporating a light scheme below an island, for instance, will give the illusion of floating, and kitchens with high ceilings will benefit from lights placed above cabinets and directed upwards; this brightens the space and will reduce the need for more LED downlights. Broadly speaking, kitchen lighting will fall into one of four categories: mood, task, feature and pendant. It’s all about layering the light, so make the most of all lighting types to brighten your kitchen and create a three-dimensional look and feel. The best ambient setup is generally one that is dimmable with a lightwaver, allowing for you to alter the environment reflective on your mood and time of day. If your kitchen has multiple uses such as doubling as a dining, working or relaxation area, make sure to take into account that mood lighting should have its own light switch so that you can control different elements of the room. Warm wall lights are particularly useful at creating a relaxing atmosphere or, if you are looking for a more elegant evening feel, floor wash lights can really bring the room to life. This is what we think of in the kitchen; lighting that brightly lights up areas of frequent use. LED spotlights are perfect for this task and can be fitted under cupboards or directly above appliances and worktop areas. 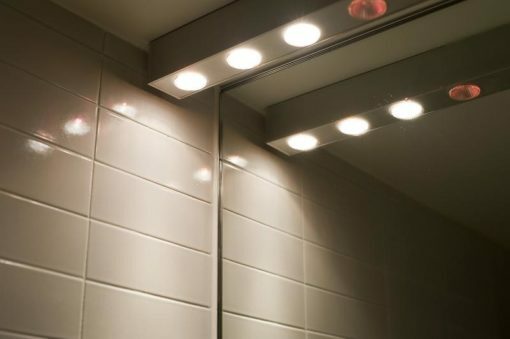 What’s more, single LED down-lighters offer slim and convenient shards of light, but LED strip lights provides a more concentrated effect under well used cupboards. Under-cupboard lighting is perfect because it prevents your shadow from blocking the work done on a worktop. What’s more, because LEDs have such a low heat output, they will not heat up food accidentally. LED ceiling lights and spotlights are another option here, particularly multidirectional modern spotlights with the correct beam width for the area in need of task lighting. Another element which works very well would be LED downlights fitted into glass cupboards. These not only perform some task in lighting up well used areas, but they provide ambience and mood as well. LEDs make for perfect kitchen feature lighting, whether it’s an eye-catching wall pattern, an illuminated word or phrase or draped string lights, these draw-attention to elements in the room. As such, feature lighting can also refer to in-cupboard light, LED runners under your kitchen’s units, or even dedicated plinths. They add character to a room without being essential for practical purposes. Don’t be scared of colourful lighting as well. Although it may not be for everybody, bold statement colours can work to illuminate areas and draw attention to statement items like vases or plants. Pendants provide characterful centre pieces to your kitchen setup, working particularly well above dining and bar areas or your kitchen’s island unit. Styles are multifarious and you can choose from homely classics, retro mid-century modern pendants or more industrial setups of metal. Hanging them low from the ceiling creates a sense of intimacy whilst drawing attention away from the more utilitarian spot and task lights. 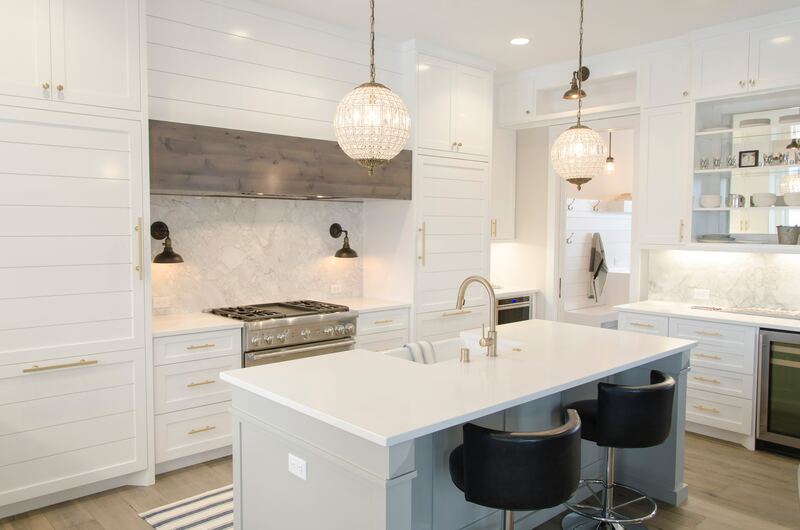 Pendant lights work best in larger kitchen settings with open space and high ceilings, but their function can be replaced by LED ceiling lights and spotlight bars in more cramped kitchens where space is key. Pivot spotlights even make for great alternatives to pendants in open, industrial styled kitchens, allowing you to move light direction depending on your needs. LED bulbs and lights can be used in your kitchen in a multitude of ways, just remember to plan well and layer your choices. Try to avoid large blocks of lighting grids and use light where it is required in the above categories. In general, warm lighting tends to offer a more homely aesthetic than cool white or blue LED bulbs, so buy accordingly. Research what lights are available, consider your kitchen’s size, layout and access to natural light. Finally, pay attention to where you’ll place and control each light switch and lightwaver. 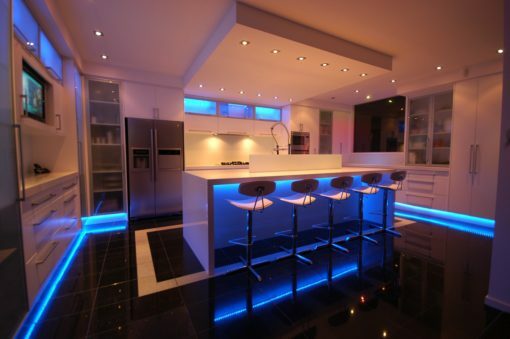 Then you’ll have your dream kitchen illuminated spectacularly to create the perfect atmosphere. LUXLIVE 2018 Register now for Europe’s largest lighting show! It’s free! How to get LED downlights? Where do you get them? Which is better for eyesight, CFL lamps or LED lamps? What is the difference between a clear LED and a diffused LED? Why is an LED downlight getting more and more popular? What is the best way to install downlights in a ceiling? Are the prices of LED downlights coming down? Can you change the color temperature of an LED? If I dim led lights do they consume less energy? Lighting: What is the difference between GU10 and GX10 lamps?